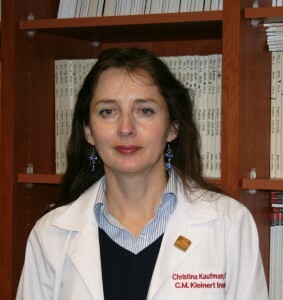 Dr. Christina L. Kaufman is the Executive Director of the Christine M. Kleinert Institute for Hand and Microsurgery (CMKI). She is an Assistant Professor in the Division of Hand Surgery at the University of Louisville. She received her PhD from the University of Pittsburgh, under the mentorship of Rene Duquesnoy and Adriana Zeevi. Dr. Kaufman worked on transplantation tolerance protocols in experimental and clinical models at the Institute for Cellular Therapeutics where she was the Associate Director of Clinical Trials and the Director of the Flow Cytometry and Imaging Laboratory. Kaufman has been an IRB member for nine years. She has worked with the Louisville CTA Program as a collaborator since 1999, and with day-to-day oversight of the program since 2007. Dr. Kaufman has recently implemented a research study using very high resolution Ultrasound Biomicroscopy to image graft vasculopathy in hand transplant patients as well as conventional hand patients. Dr. Kaufman is a committee member of the International Society for Hand and Composite Tissue Transplantation, is the 2013 Chair of the American Society of Transplantation VCA Advisory Council, and is on multiple committees of the American Society of Reconstructive Transplantation.